Lightly oil each side of the wonton wrappers, and carefully press them into each muffin tin. Bake for 5 to 7 minutes, until crispy and slightly browned. Set aside. Cook the noodles according to the package, then drain. Set aside. In a small bowl, combine brown sugar, soy sauce, fish sauce, lime juice and chili paste. Heat a large skillet over medium-high. Add the oil to the pan. Add the scallions, shrimp and minced garlic. Stir-fry roughly 2 minutes, until shrimp is done. Add the cooked noodles and stir to toss. Add the sauce and toss to combine. 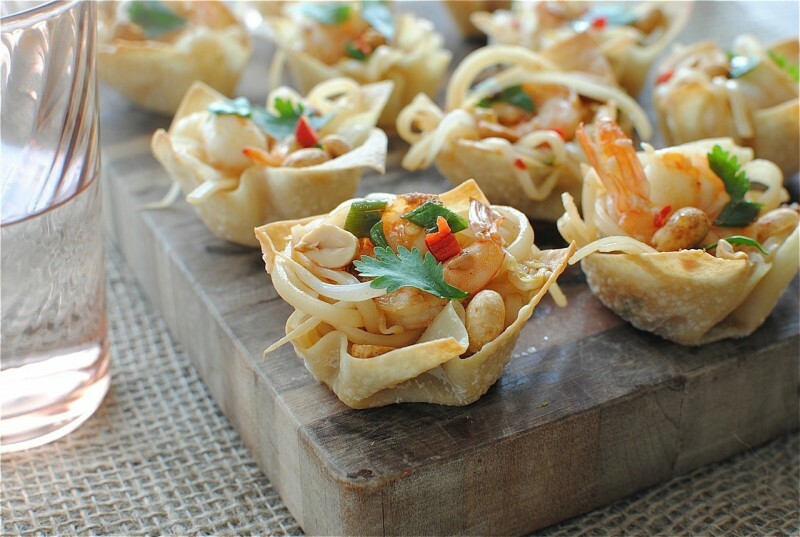 Using tongs, place a small amount of the pad Thai inside each wonton cup. Nestle a single shrimp in the pad Thai nest, and garnish with peanuts. Your blog is simple and it is easy to understand, the layout is smartly organized. Is that this a paid theme or did you modify it yourself?. Anyway, I will buy all the ingredients given here. I will cook this tonight at our dinner and I'm sure my daughter will love this. Thank you!